Hoard’s Dairyman magazine, the only U.S. agricultural publisher with its own operating dairy farm, is now producing high-quality specialty cheese using milk exclusively from the historic Guernsey herd. 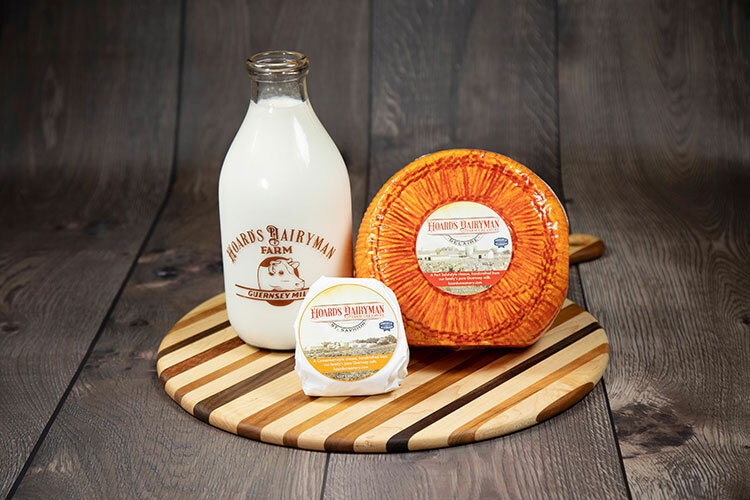 Marketed under the brand name, Hoard’s Dairyman Farm Creamery, master Cheesemakers are hand-crafting Port Salut-style and Camembert-style cheese varieties to launch the brand. “Our plan to produce unique, high quality cheese with our Guernsey milk was years in the making,” said Hoard’s President, Brian Knox. “We knew the milk from our Guernsey herd was exceptional, but the flavor, texture and volume of cheese produced from our milk surpassed all expectations. The rich taste of our Guernsey milk really comes through in our cheese,” he added. The Creamery’s Port Salut-style variety, named Belaire, for the naval captain who was the first to bring Guernsey cows to the U.S., is a classic, mild and creamy cheese that’s highlighted with a distinctive orange rind. The Camembert-style variety, named St.Saviour for the small, picturesque village on the Isle of Guernsey, is a rich, buttery cheese with a creamy core inside a brilliant white rind. W.D. Hoard was a pioneering publisher and the former Governor of Wisconsin. Soon after launching the legendary magazine, Hoard’s Dairyman, in 1885, he established his dairy farm just minutes from his publishing office. Today, descendants of Hoard’s original Guernsey herd still call the Hoard’s Dairyman Farm their home, and his magazine continues to be the most influential publication in the dairy industry. Since 1885 Hoard’s Dairyman has been providing Dairy Producers, Veterinarians and Nutritionists with Feeding, Breeding, Animal Health and Milk Quality education and guidance for profitable milk production. Established in 1899, the Hoard’s Dairyman Farm currently milks about 450 cows and is registered as a national historic site.